Me and my husband are both right handed, and being a right handed person I have never had to think about how hard it is for left handers to write. We then went on and had two children who are left handed so it’s something we have had to be aware of and are still learning ways to help our left handed kids. My son who is now 13 has had trouble over the years with hand writing. Teachers would get on at him because his hand writing wasn’t neat enough. So understandably he then would lose confidence in himself. So then he would work so hard on trying to make his handwriting neat and better that his creative writing would suffer. So then they would pick up on that and then that it wasn’t good enough. I am not concerned about his hand writing. He has such lovely creative ideas that I don’t want him to compromise that. 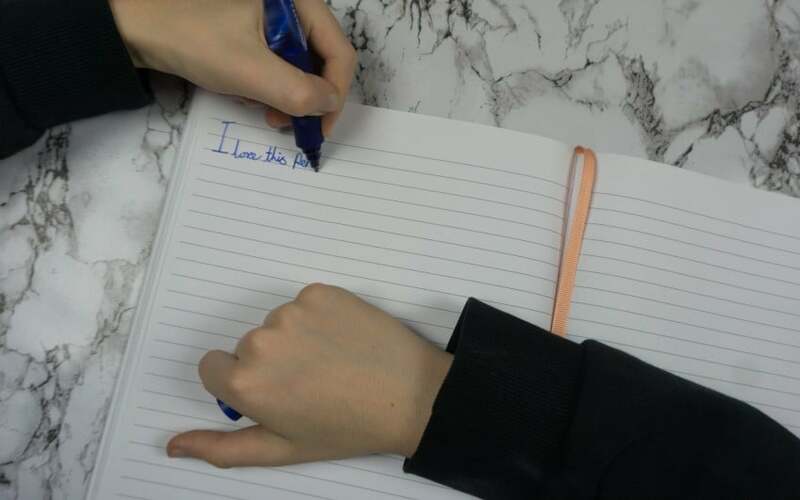 Lets get him confident in his ability to create wonderful content without the worry, and then the handwriting will come later. I couldn’t believe it, someone who cared enough to see the bigger picture. To understand him as a person and as a left handed child. It isn’t as easy for them to write neatly and it’s pretty awkward too. He instantly was relived of the pressure and concentration to write neatly. All his wonderful ideas came out onto paper. This was the making of him and I am so grateful of that year with this teacher. So when Sofia got to school age I sure wasn’t going to let that happen again and I made sure she didn’t feel that pressure. Positioning seems to be one of the biggest key to helping them. You can see my son has adapted a ‘hook’ hand so that he can see what he is writing as he writes. Otherwise it is completely covered over. Turning the paper to an angle. A 45 degrees clockwise turn will help as they then will be able to see the paper and what they write as they’re writing. Also people have found that writing on a sloped surface can help if possible. Whilst I was showing my son some new pens I was sent by Stabilo he chatted to me about how the ink always ends up rubbed on his little finger. I have just been providing him with normal pens for school and always noticed that he has ink on his hands! I just thought it was him not washing his hands properly! He said to me that this was staining Mum and he’s had a shower, washed, soaped and nothing gets it off. Then my Daughter over heard this and chipped in and said ‘oh yeah I get that too Tyler, it’s so annoying’. It’s something I hadn’t even thought of myself, and something the kids haven’t thought about telling me! 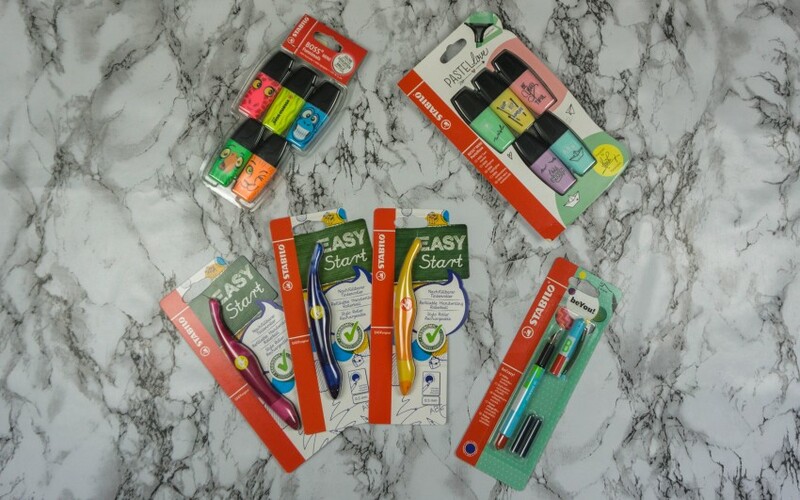 So I got them to try out these new Easy Start handwriting pens which have ergonomic shape to them. Tyler LOVED it straight away. It was shaped perfectly for him to hold in the 3 point grip that we are all taught, but as it was for a left handed child, it had shaping that suited him. You can see in this picture of my daughter she finds it very tricky to do this 3 point grip on the pens. It is something she needs to work on, but I am not focusing on the bad with her as it won’t give her the confidence she needs. A little mention now and again and to watch her Brother will be enough. Then Tyler tried writing with it and he could not believe how quickly it dried. It didn’t leave ink on his hands like normal. 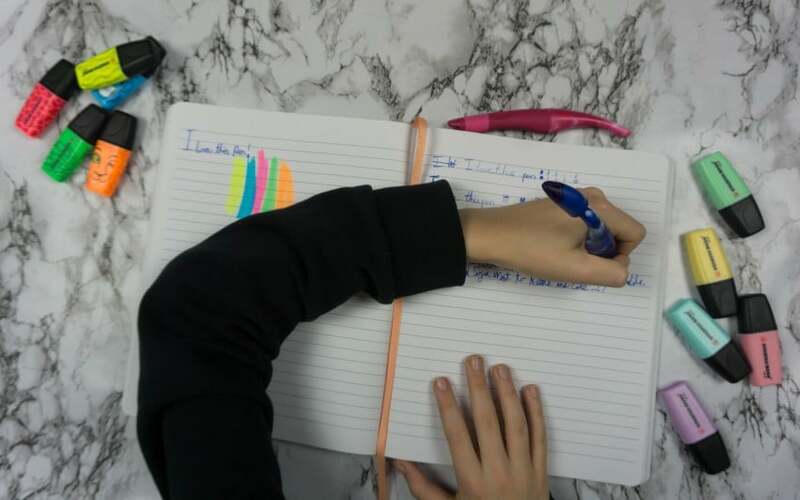 It is also suggested you have a pen that rolls nicely as you are pushing along with the paper when writing with a left hand, which these pens do perfectly. He had no problems writing with them at all. He told me that I have to buy these pens all the time now! Which I will happily do because if it helps him that much then it’s worth it. Imagine having to deal with all these things when doing an exam. If you’re a right handed person be aware when trying to teach them to write. The positions, angles and even the way we form our words are different. Cursive writing is hard as the child has finished and started their lettering in a different point, so having to go around extra ways or different ways. Make sure teachers know that your child is a left handed child too. Kids will copy us so be aware of this from an early age. Sofia is lucky she can watch her Brother and learn from his experience. This is another thing that isn’t something you would first think about. The kids need good lighting as their hands cast shadows over the writing more! You should also have them positioned at the desk high enough to see over their hand otherwise like Tyler in this picture above he slouches onto the table (I’ve seen him resting his head on it too) to see their writing more. I hope this has helped you a little if you have a child who is left handed. There is a lot of products out there that help them too so do have a look. Left handed scissors are a MUST! *Collaborative Post* Below are the products we were sent for this post. However all opinions and words are honest and of my own. Links are affiliate links which means I earn a small amount for suggesting these but it does not cost you more. This was quite an interesting post for me. My eldest is left handed. 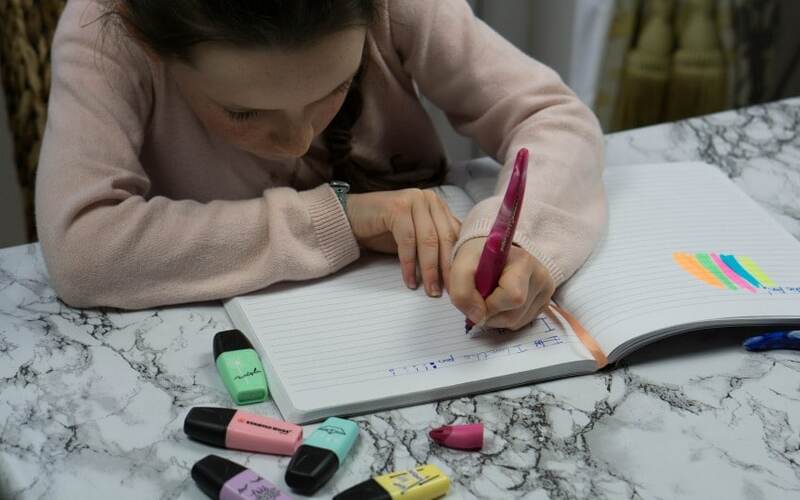 Although she doesn’t have problems with writing she seems to learn that bit differently to right handed children – apparently it’s a thing according to our tutor. Bet she’d love to give these pens a go. Oh how do they learn differently? My two left handed kids are very different in character and how they learn! As a 50 something left hander, I use the 45 degree method, although I tend to turn the paper to more like 70 degrees which avoids the hook. Other things which are troublesome are Scissors and Chopping / Serrated knives, using right handed scissors left handed tends to pull the blades apart. Many chopping knives pull to the left to compensate for right hand use, this is a real problem as you need to double compensate when using them left handed. 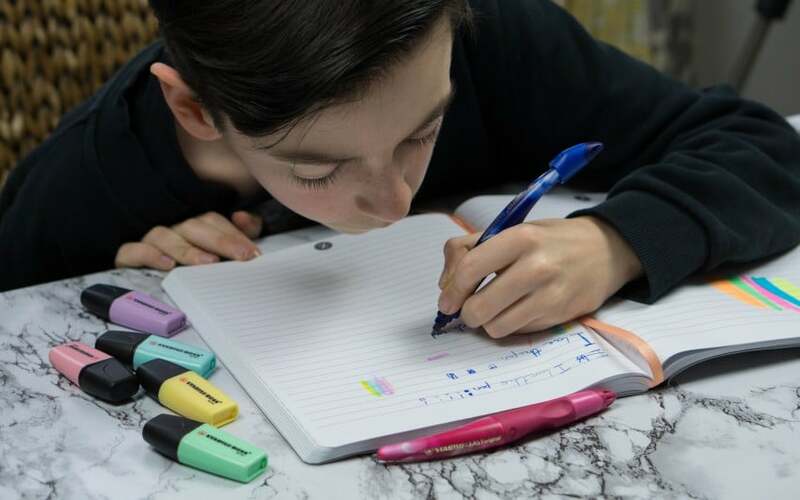 My oldest is a leftie… His handwriting looks exactly like your sons and he, too, uses the hook method to see what he has written. These pens look great, I’ll have a look at them for him. Did you know there’s a LEft Hand day? Haha! 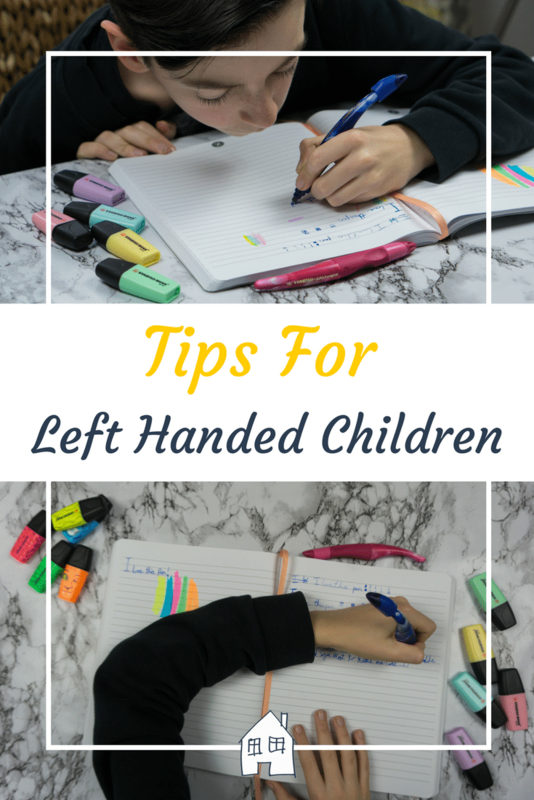 These are great tips I’ve always thought that children who are left handed might need a little extra help along the way. Thanks, yes just thinking about things in a different way for them. Oooo this may come in handy! Our little one seems to be favoring her left and my husband and I are clueless! Glad it might help, it’s the same for us as well as were both right handed! I’d never thought of any of these issues. Such a helpful post, and I’m glad you’ve discovered a good pen for Tyler. Thank you, yep he loves it! It’s in my Amazon basket ready to buy some more!! We’re all right handed, but my sister is left handed so I will send this to her! Some good tips. Yes mine get very frustrated by the ink smudging, although this week he’s happy as he has his new pen!! Good your son got a lovely teacher that saw the bigger picture. Fab tips here. Yes we were SO relieved. This is such a great post! My hubby is a left hander and faces lots of little annoying things, like tin openers! We’re not sure if either of our girls will be lefties yet. I think it makes you special – only 10% of people are left handed apparently. Some great products! Thank you, ah is it only 10%? Wow! Such a useful post. As a righty I think it’s easy to take for granted how tricky being left handed can be! These are great tips! I’m a teacher and can definitely see how these could be handy in the classroom too. Thanks for sharing. Ah glad you liked them. That’s good feedback from a teacher too! I was lucky. My older son taught his brother how to hold pen etc. as both my hubby and I are right handed. Funny, never had a problem with handwriting being neat. Left handed children are very creative ….so I have been told … my sons are so maybe that is true..
Ah that’s good that he had someone to watch and learn from. Thats lovely to hear he had no problems with his hand writing.